Katherine works as a full time painter and exhibits from Portland, Oregon to New York City. She has been recognized as an accomplished artist who is shown and collected both nationally and internationally. Now living in Portland, Oregon she is inspired by the wild and dramatic landscapes of the Pacific Northwest. Katherine enjoyed many years as an established artist in Chicago, but grew up in and completed her art education in Detroit, Michigan. She has had many significant exhibitions including an exhibition at the Illinois State Museum, has been archived in the National Museum of Women in the Arts in Washington DC and her artwork is included in many important collections. Katherine has been actively involved in the arts community in Chicago by participating in and developing exhibitions and publicizing the arts. 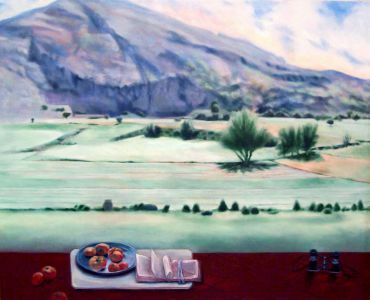 In Portland she has exhibited her work, taught painting at Portland State University and has joined Portland Art Museum Art Councils. Katherine, for the past four years, has been exhibiting at the prestigious Walter Wickiser Gallery in New York City. During Katherine’s time in Chicago she was an active artist in the Chicago art community where she participated in exhibitions, joined galleries, and took part in art selection committees. She was selected to be the director, curator and records coordinator at Art-EXPO Chicago for ARC gallery, curator of the West Hubbard Gallery, and chairperson of the Evanston Art Center Co-op Gallery. Katherine’s work in Chicago lead to recognition to her artistic ability and achievements. She has been archived in the National Museum of women in the Arts, Library and Research Center: Archives of Women Artists, Washington D.C. and has been awarded and published in Who’s Who of American Women, Marquis Who’s Who, New Providence, NJ. Katherine received both her BFA in art and art history and her MA in painting and printmaking from Wayne State University. During her graduate studies Katherine was recognized for her outstanding artistic abilities and achievements by being given the first place award in graduate drawing and printmaking. Furthermore, she was chosen to participate in an intensive graduate study program at Cranbrook Academy. After her graduate studies she moved from Detroit to Chicago, Illinois. Soon after her move to Chicago she worked for VISTA helping immigrants. There she became inspired by the craft of iconography. She studied and taught herself the iconographic art of applying gold leaf to paper and began using gold leaf in her creations. Katherine has been a dedicated teacher of the arts and has been recognized for her exceptional work as a professor by receiving multiple outstanding teaching awards from Oakton Community College. Katherine has taught a large breadth of courses including studio arts and art history at Oakton Community College and at Harry S. Truman College in Chicago, Illinois and Portland State University in Portland, Oregon. Katherine has also had an interest in social issues. She initiated art programs for schools and participated in the VISTA social service program in Chicago. Prior to receiving her Master’s Degree Katherine taught art at elementary and high school inner-city schools to children below the national poverty level. 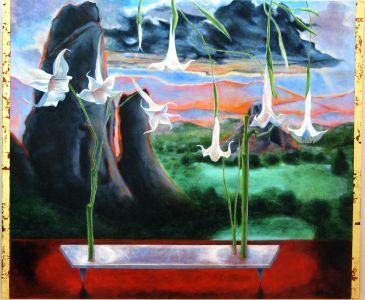 Over the years Katherine’s work has been recognized for its complexity, depth of content and its complementary flow of images that evoke contemplation. Her earlier artwork contains many symbols and objects and focuses on the intricacies and details of the objects. Her more recent work also focuses on the symbolism of objects, but expands its view from more minute details of the object to the grand and often captivating impact of natural landscapes. Her artwork has evolved together with her artistic, personal and cultural experiences. 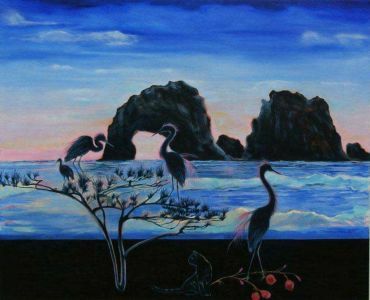 The otherworldly quality in her artwork and her keen perception of the world for which she has become known is very much influenced by Surrealism and Magical realism and resonate her experiences in life on canvas.